Earlier, in November, Lyle had assembled a sample board provided by SLAPR, and it had worked perfectly. A second test board was hand assembled in November when the first production lot of Beta boards were shipped by the PC production facility. They had tested and calibrated with no problems. After a brief, fitful rest, a meeting was held via telephone with Den KD2S, Lyle, WA7GXD, and Mark Baker, TAPR secretary and member of the Board of Directors. It was decided to temporarily halt Beta production and meet with the PC house. This action was taken, and three TAPR executive officers hurried to the PC facility. After much discussion, a PC board was cross-sectioned and examined under a high-power magnifier. The sight was sickening. A hairline crack encircled each plated-through hole near the pad on the solder-side of the Beta board. Further checks revealed the problem was a plague -- every board checked had the same problem. This	explained	the	solderability	problem:abnormal heat transfer due to a break in thermal conductivity. It also explained the disastrous fallout rate of boards	during testing. A few working boards were flexed, and experiments indicated that non-working boards could be	made intermittently operational, while working boards could be	made non-functional. 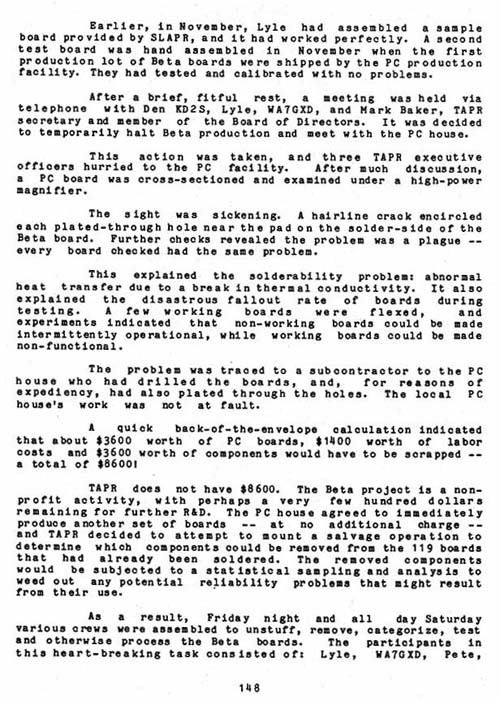 The problem was traced to a subcontractor to the PC house who had drilled the boards, and, for reasons of expediency, had also plated through the holes. The local PC house's work was not at fault. A quick back-of-the-envelope calculation indicated that about $3600 worth of PC boards, $1400 worth of labor costs and $3600 worth of components would have to be scrapped -- a total of $8600! TAPR does not have $8600. The Beta project is a nonprofit activity, with perhaps a very few hundred dollars remaining for further R&D. The PC house agreed to immediately produce another set of boards -- at no additional charge -- and TAPR decided to attempt to mount a salvage operation to determine which components could be removed from the 119 boards that had already been soldered. The removed components would be subjected to a statistical sampling and analysis to weed out any potential reliability problems that might result from their use.